Nestled among the row of old school cafes, restaurants and shophouses along the stretch of Cikini Raya, is a totally unassuming black exterior facade. 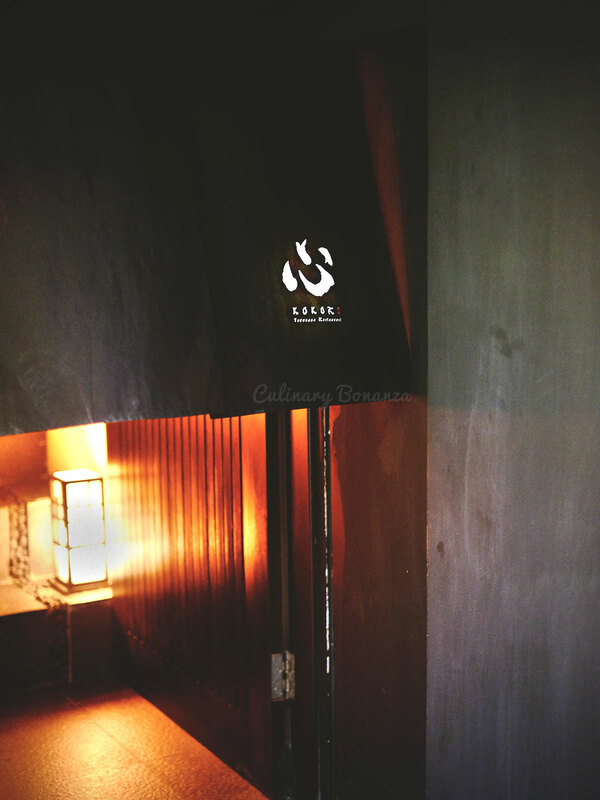 At the door hangs a black cotton, Japanese style curtain, partially revealing a set of concrete steps that lead to the restaurant upstairs. The entrance is inconspicous, almost to the point of blending in with its next door neighbours. So unless you walk on the pedestrian curb or came looking for it deliberately, chances are, you would most likely miss it. 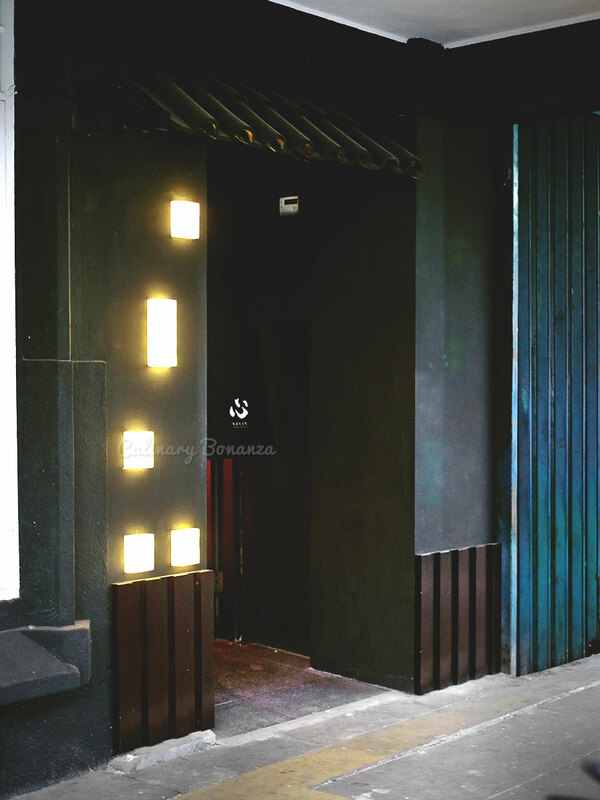 The unobtrusive entrance is intentionally so to recreate the experience in Japan, where some of the best restaurants there, are known to have unobtrusive, if not hidden, door. My heart quivered with anticipation as I revealed the black curtain and scaled up the stairs. Like the unassuming exterior, the interior is not fancy. The minimalist approach in the colour and decor elements mimic that which I often seen in Japan (from television, photos, magazines etc). 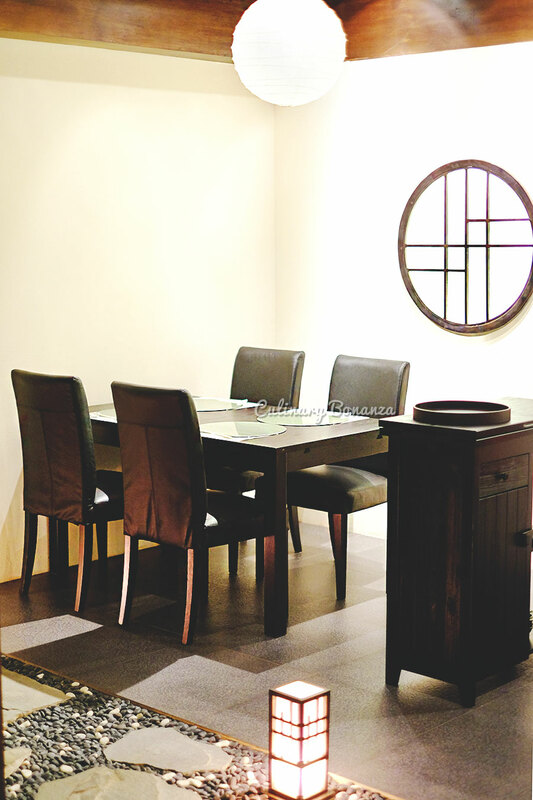 There's one main open dining area that can seat 8 persons in total and the other side, there are 2 private rooms on elevated platform, each can fit 6 persons and when the partition is opened, it can fit a larger group. The waiting staff are ladies clad in traditional Japanese kimono, who would greet the guests in Japanese (don't be surprised), I was thrown a little off guard by that to be honest. For a while I thought I was in Japan, but once she started to explain about the menus in Bahasa, I was rooted back reality. So let's start with the drinks menu, some of the basic items such as soft drinks and mineral water are pretty reasonably priced for a fine dining place (IDR 30,000 - 50,000). Then there's the beer and some Japanese Spirits which can be bought by the glass, these too are still reasonable (IDR 70,000 - 90,000). There are also some fine premium wines and sake on the list, available by the bottle. Order a cup of warm ojicha instead! 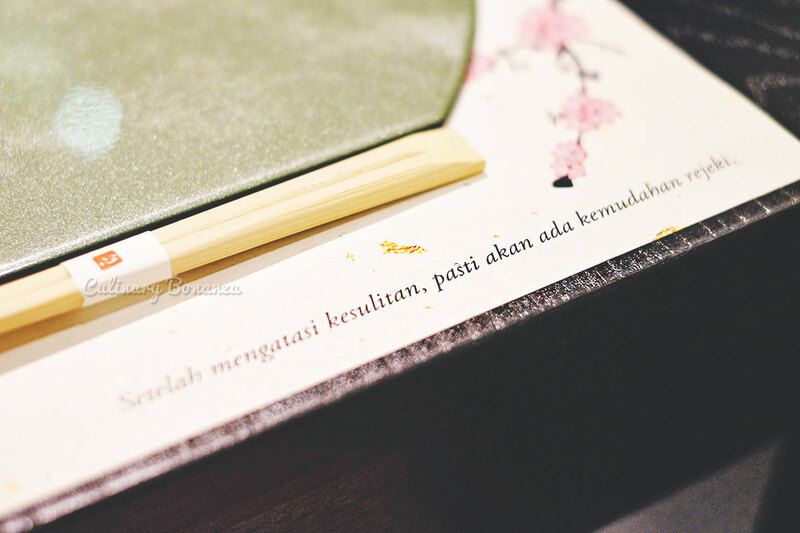 The owner of Kokoro envisioned Kokoro to be a collage / a collection of the best cuisines and produce from all over Japan, curated and flown in to Jakarta. 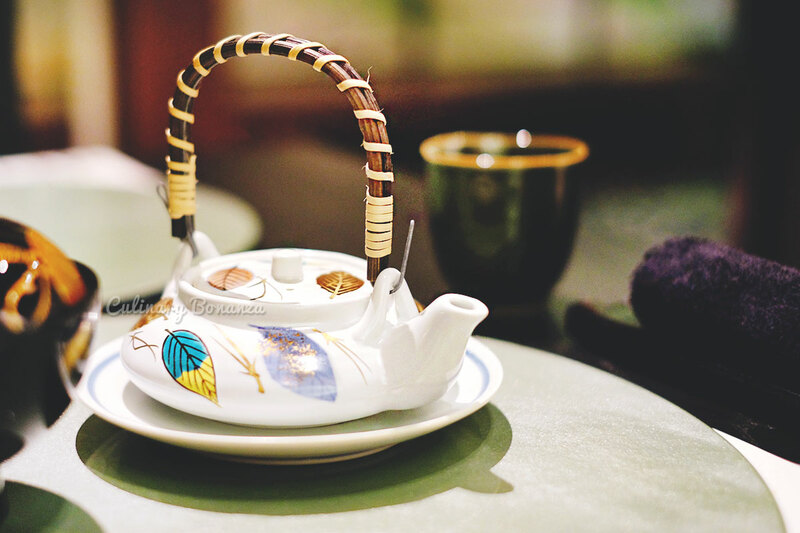 Some are even produced in-house using the original technique / recipe that he acquired from the proprietors in Japan. So, to really appreciate the concept of Kokoro, the Kokoro course is of course the top recommendation. 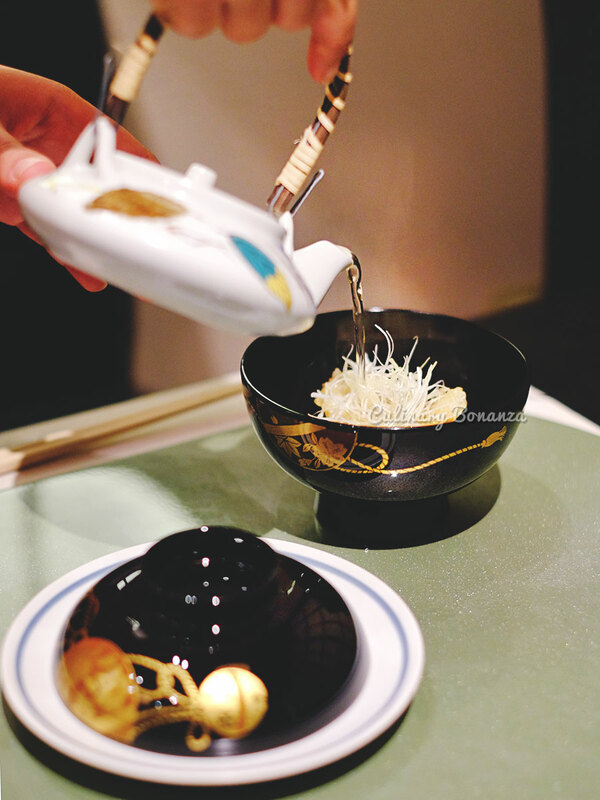 It is a set of omakase comprising 10 specially curated dishes, from Appetizers to Dessert. (photo above) Appetizer #1: Steamed Abalone with wasabi jelly sauce, served with caviar. 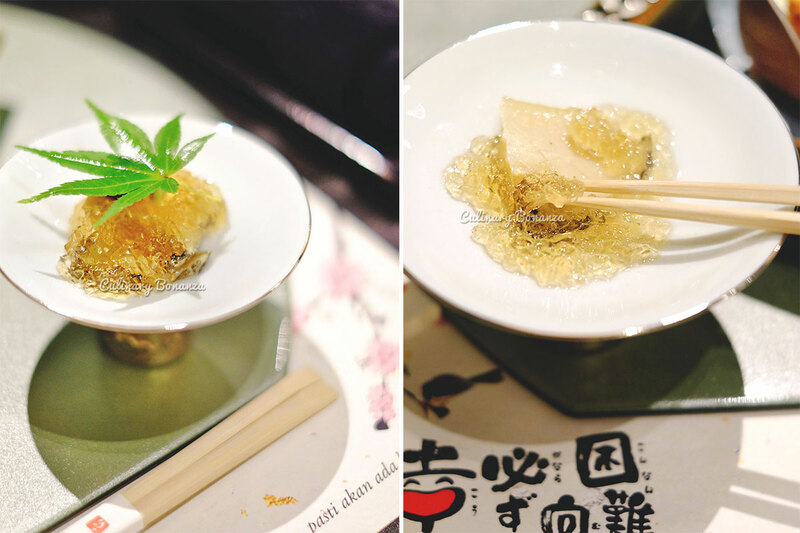 The cold jelly, made from dashi stock, melted in the mouth to release the rich umami flavour of the homemade broth. (photo above) Appetizer #2: Homemade Tofu coated with beko an & topped with uni. The tofu itself is a special recipe of tofu from a legendary tofu maker in Kyoto, which the owner visited and persuaded to sell. So that he could recreate the recipe in Indonesia, to self-produce fresh tofu anytime to serve the customers. 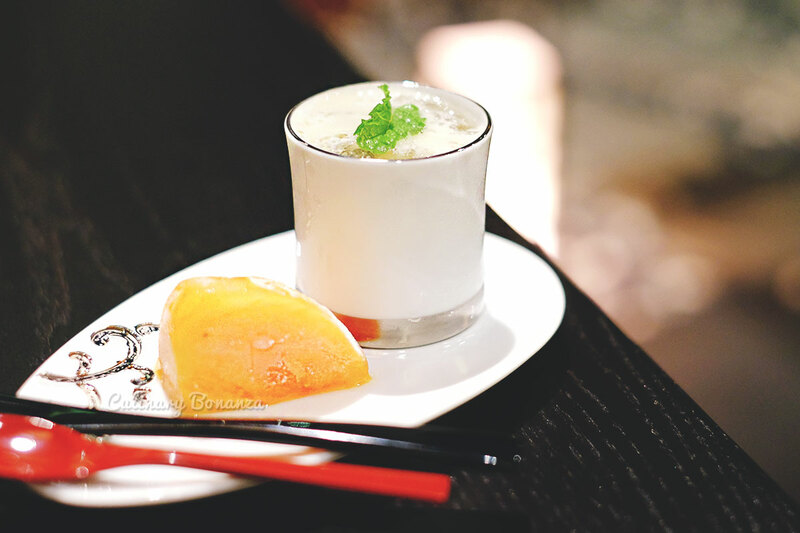 The key in making tofu, said the owner, is in the soya bean milk and while he didn't disclose how special the milk is, I can imagine the effort that goes into that small block of soft & creamy white curd. But the surprise didn't stop there, there's a block of uni on top of the tofu. It was my very first time trying a real fresh uni and despite my brain screaming in disgust, I must say it actually tasted not as bad as I imagined it would be. 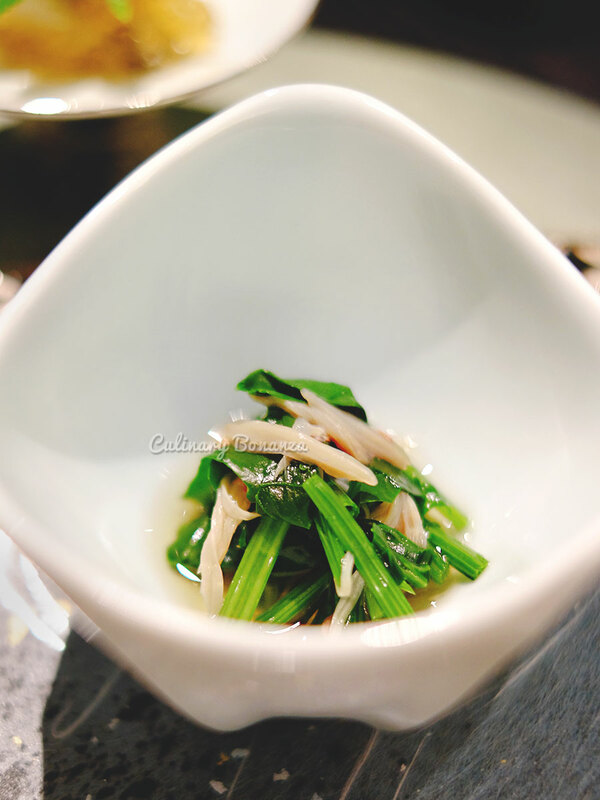 (photo above) Appetizer #3: Horenso Spinach in dashi broth. The 3rd appetizer was supposed to be something else, ingen (string beans) with gomabitashi sauce, sakura ebi & yang corn, but it was not available at the time of my visit. (photo above) 4th course - Soup : Clear soup with deep fried Grunt, served with garnishes (thinly sliced Japanese ginger, green onion and green yuzu). Have you ever tried grunt fish before? Nope, I had not, but it tasted great, fried and eaten with the garnishes together. 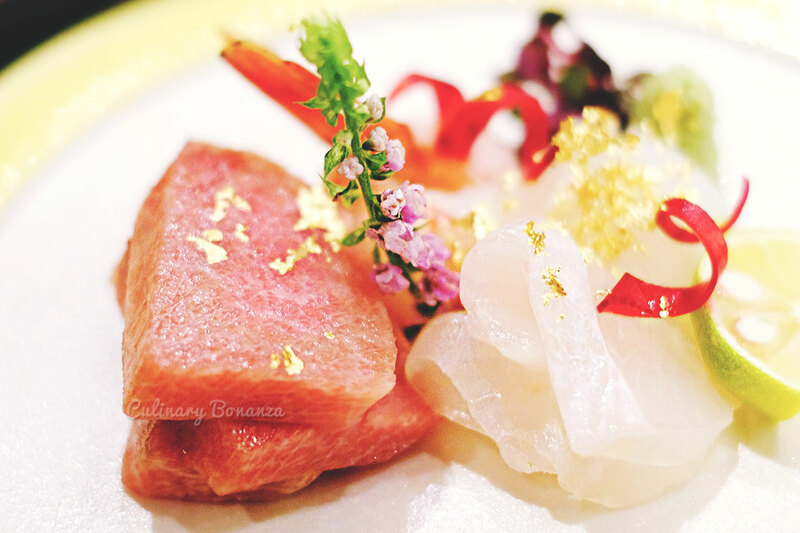 (photo below) 5th Course - Sashimi: Seasonal fresh sashimi, hotate (scallop), tuna, botan ebi (prawn). 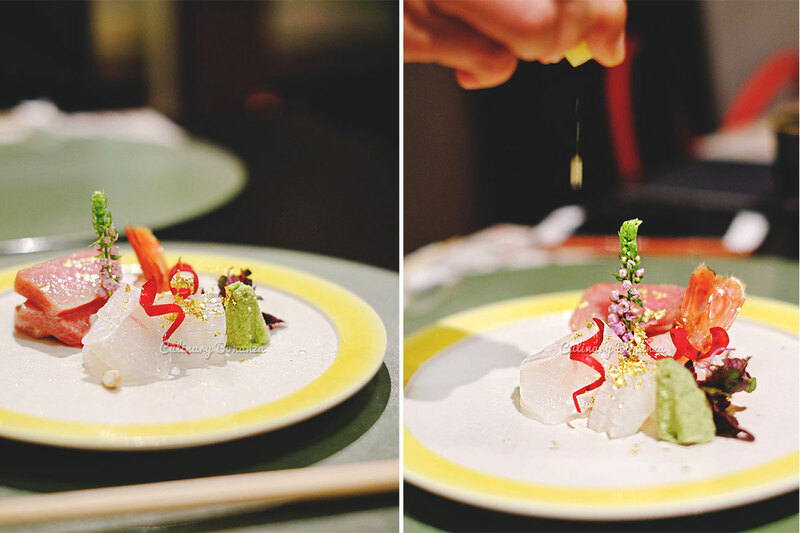 If you think the previous courses might have been pretty ordinary, the next one is definitely quite special, even more so if you're a sashimi lover. 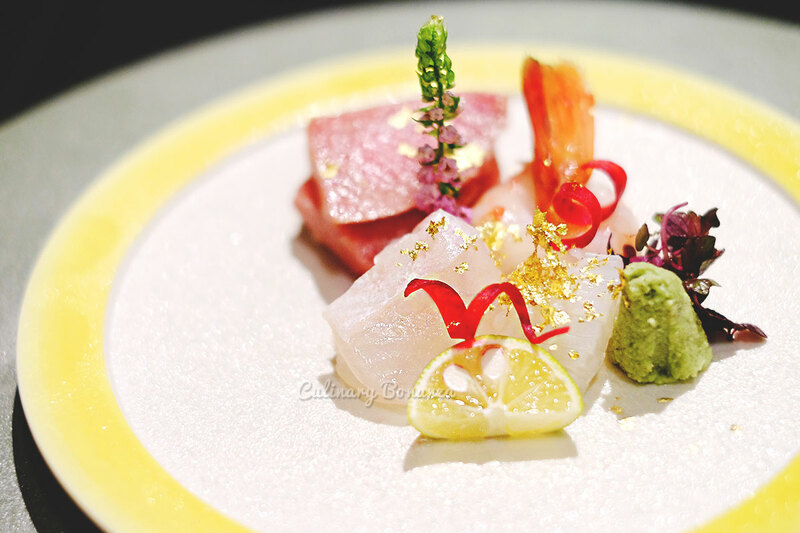 It's quite a flashy sashimi I must say, topped with edible gold flakes and pretty flowers, the plate looks like a little pretty garden. And I must not fail to mention that the sashimi was absolutely fresh. If before I started food blogging I used to fear raw seafood, nowadays I find myself actually enjoying it. 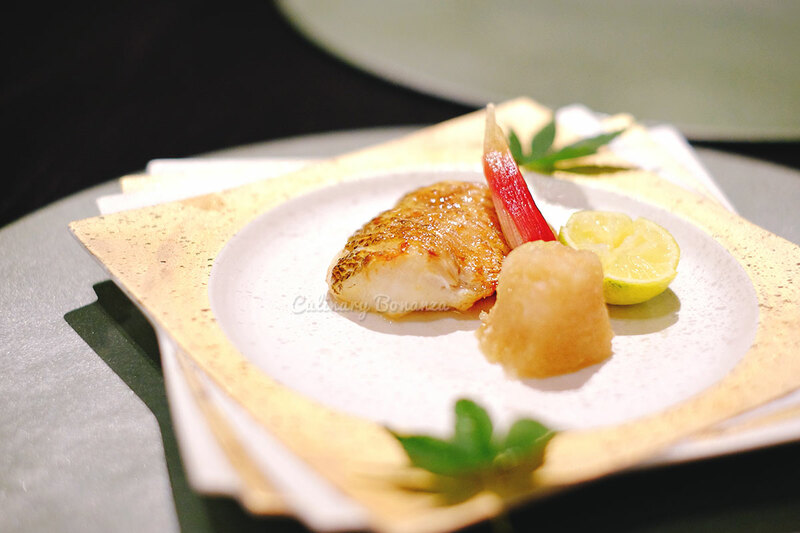 (photo below) 6th course - Broiled Dish: Rosy Seabass Broiled with salt, served with Japanese ginger, grated Japanese radish and Japanese citrus. The seabass was amazing succulent, fat and juicy, with crispy crust, but the joy of digging into this course would be even more, with the japanese ginger paste and pickled myoga ginger (the red pointy shoot in the middle). 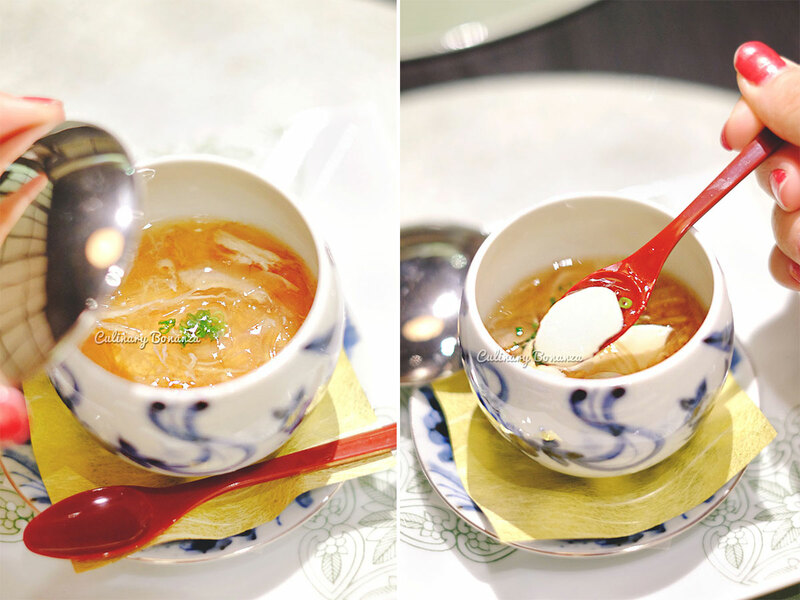 (photo below) 7th course - Steamed Dish: Chawanmushi with crab meat, shark's fin and seaweed sauce. 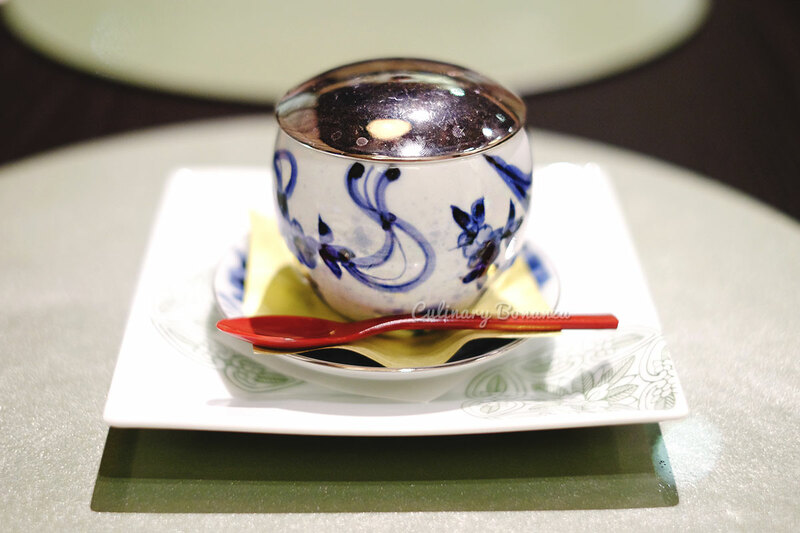 This was definitely one of the best and lavish chawan mushi that I've ever had. 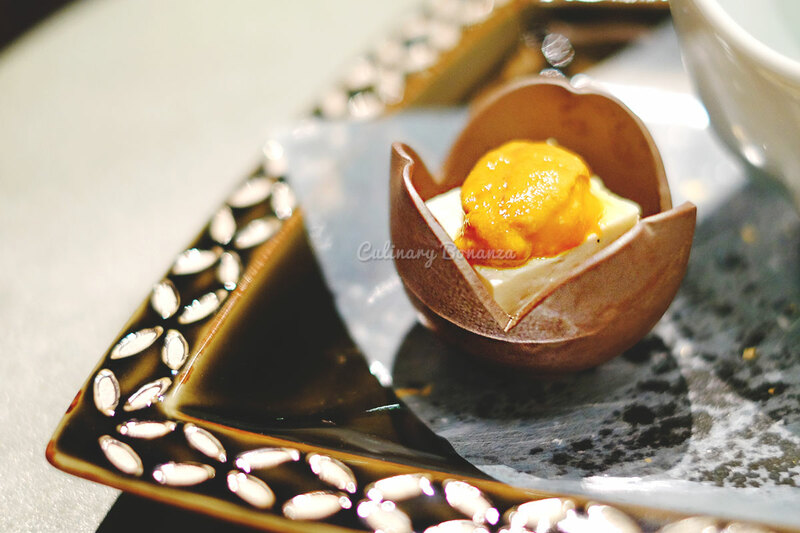 The egg curd itself had a perfect texture, solid yet soft and melts in the mouth. (photo below) 8th course - Cooked Dish: Homemade roast beef with vegetables. The menu name is a major understatement of the delightful dish that appeared before me on the beautiful blue and white square ceramic plate. 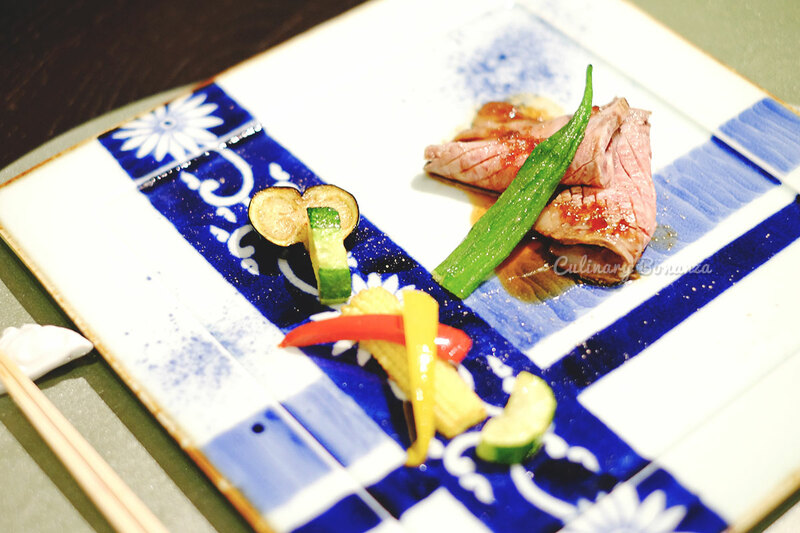 2 thin rosy pink slices of A5 level Imari beef sirloin (supposedly number 1 beef in Japan), drizzled with soy sauce and wasabi and served with roasted with vegetables such as eggplant, zucchini, sweet baby corn and okra. The beef was cooked, but somehow still manage to retain the juiciness and tenderness of that like raw meat. It was as if it had been cooked by sous vide method, but I confirmed with the owner that it was grilled conventionally. 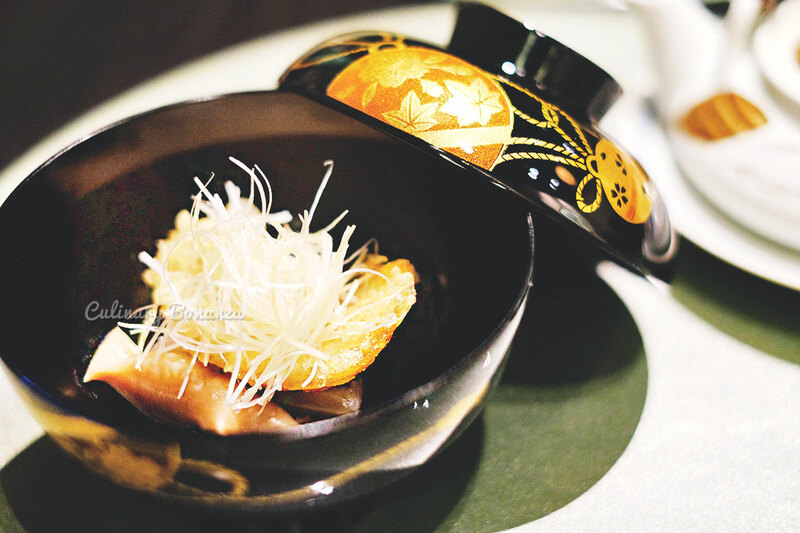 (photo below) 9th course - Rice: Rice cooked with grilled sweetfish, served with red miso soup & Japanese pickles. 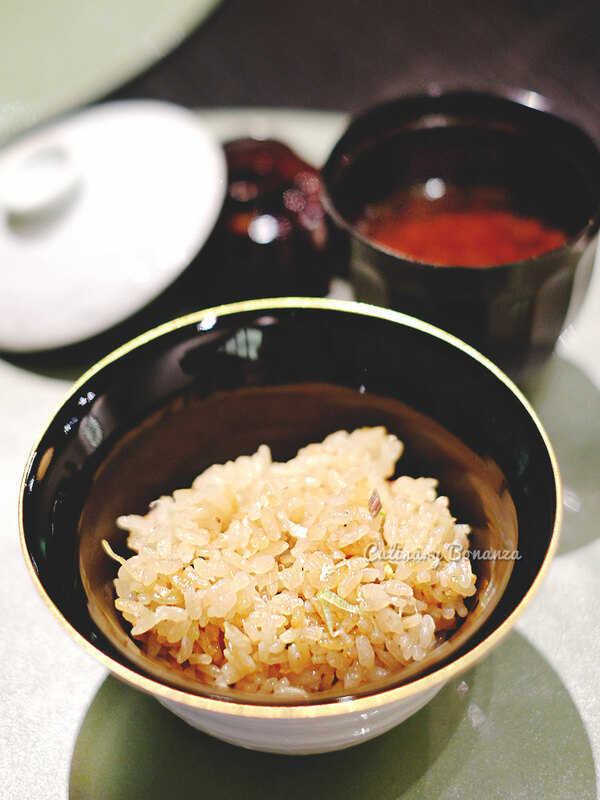 The rice itself, koshihikari, is a very special and most expensive variety of rice in all of Japan. The rounded grains are rather sticky and very slightly chewy. A platter of jelly with fruits and frozen persimmon. Somewhat a rather abrupt decrescendo of the enjoyable procession of fresh seafood and one amazing beef dish, the dessert served at the very end was minimalistic, but it served the purpose as a palate cleanser and sweet ending. 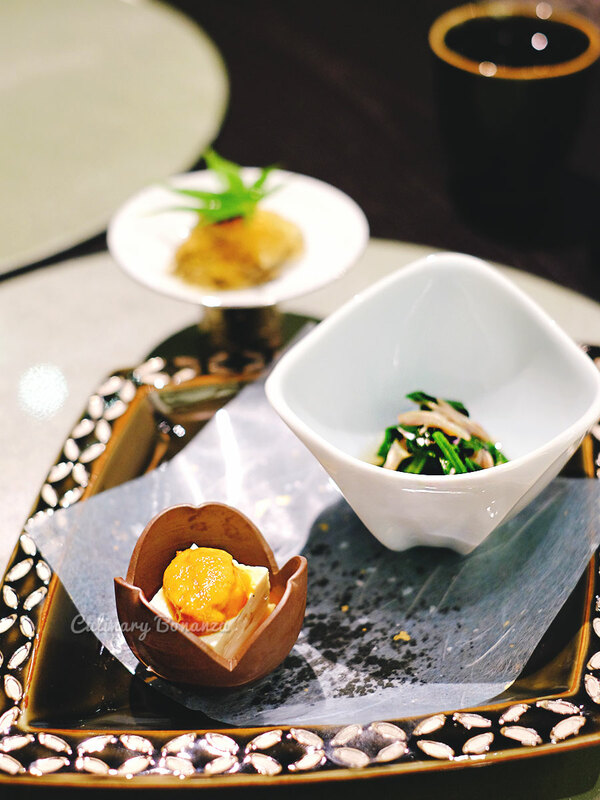 The omakase courses changes seasonally, according to the seasons in Japan, so what you see in my photos above might not be the same as what the guests might get in a few months from the day this post was published. 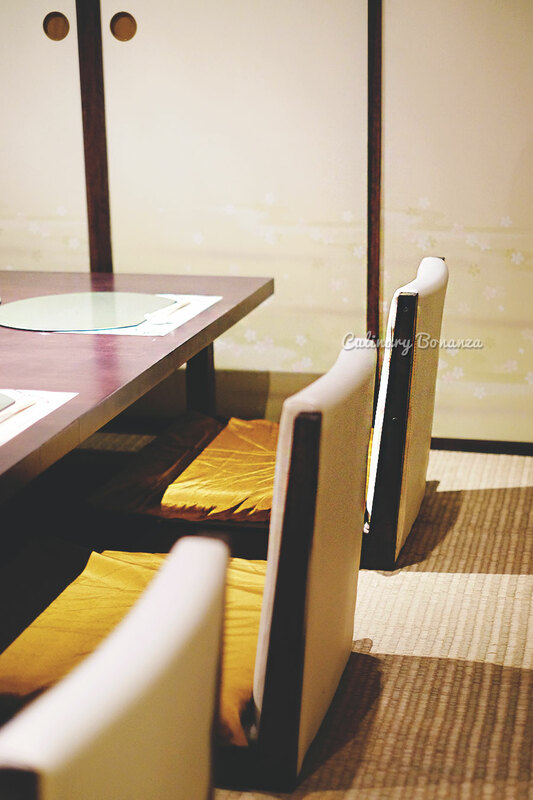 The owner also emphasized about Kokoro's omotenashi, a noun that means 'to entertain guests wholeheartedly', or simply, sincere hospitality. 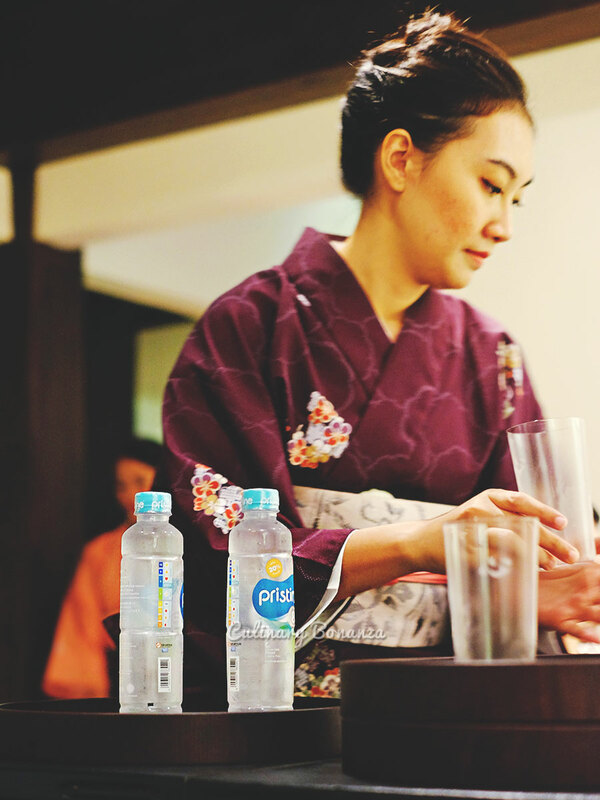 The ladies clad in traditional yukata, are kokoro's staff who are dedicated to pay special attention to each tables. So don't be surprised or feel uncomfortable if you notice that they seem to be hovering around you, because that's part of the omotenashi. They are supposed to be alert all the time and be aware of when you've finished with a dish or if you need anything, before you even ask for it, put simply, to anticipate the guest's needs. That's what makes Japanese customer service superior than what's found everywhere else. So, what's my verdict? Will I say that it's worth the price tag? If I only need to fork out roughly USD 200 to sample the best delicacies from across Japan, without having to fly or spend the time traveling, this is definitely a great deal. 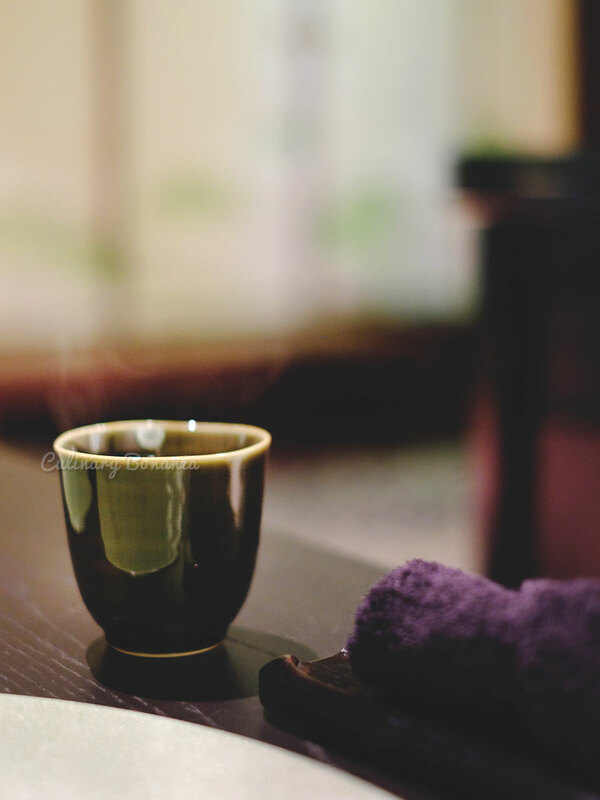 Kokoro is not a place where you'll find extreme or exotic Japanese delicacies such as the deadly poisonous fugu (puffer fish) or whale sperm and such (thank God for that!). Admittedly, Kokoro course was certainly the most expensive meal i've ever consumed at one go, but the experience was nothing short of divine. Currently open for dinner only. Each cycle of omakase lasts roughly 2 hours. Not specified, but smart casual is a safe choice. 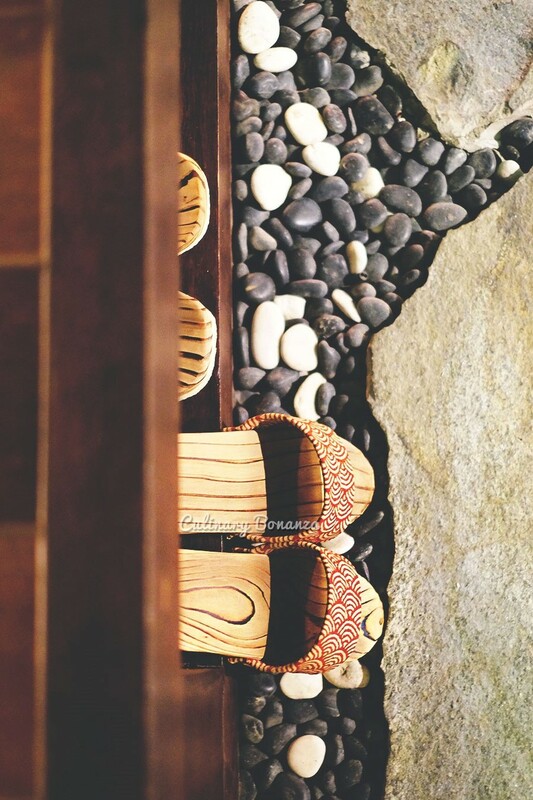 I really love and admire how you story tells us your experience. Great job Ellyna!